The following points illustrate the protective benefits of wearing the right eyeglasses. Eyeglasses are a necessary part of daily life for many North Americans. In the U.S. alone, more than six out of every 10 adults wear some form of corrective lenses, be that over-the-counter reading glasses, prescription glasses or contact lenses. Glasses not only correct our vision, they also play an important role in protecting our eyes, so it’s very important to choose the best glasses for your needs. The following points illustrate the protective benefits of wearing the right eyeglasses. While we may give time and thought to pursuing a healthy lifestyle through eating a healthy diet and/or exercising, finding ways to improve our vision is not something we usually think about. Regular eye exams are essential for determining if we are far-sighted, near-sighted or have astigmatism. All of these conditions can be corrected with prescription eyeglasses. Also, if you’re over 40, you may notice an inability to focus up close, as when you’re reading or working on the computer. This is called presbyopia and, for some patients, over-the-counter reading glasses, which have single vision lenses, are sufficient for their needs. However, over-the-counter glasses will not be able to cover the needs of people who have trouble seeing at a distance and/or intermediate distances, as well as up close. These eye problems are corrected with a prescription for multifocal lenses, either bifocals, trifocals or non-line bifocals (progressives). When purchasing eyeglasses, it’s a good idea to invest in lenses treated with both anti-reflective and anti-scratch coatings. An anti-reflective coating can minimize damaging UV rays from the sun and glare, while reducing reflection in the lenses and an anti-scratch coating will increase the longevity of your lenses. If you choose progressive lenses, you may be advised against buying lenses that have a small vertical distance, as this can limit the range for comfortable reading. Ultraviolet rays from the sun, both UVA and UVB, can cause a number of eye diseases, although UVA light has been connected with the development of more eye and skin issues than UVB rays. According to research, over exposure to UV rays facilitates the development of cataracts, eye and eyelid cancers and benign eye growths like pterygium, which is a fleshy tissue on the cornea. It’s also important to remember that UV rays can penetrate cloud cover. If you enjoy snow sports, such as skiing, you should be especially careful on sunny days. The intense reflection of the sun on the snow can cause “snow blindness,” which is essentially a sunburn on the cornea. The effects of snow blindness are usually temporary, but you can experience poor vision and severe pain during such an episode. Purchasing the darkest pair of sunglasses we can find isn’t actually the best option, because the colour and darkness of the lens doesn’t necessarily reflect its ability to absorb UV light. The best way to protect your eyes from sun damage is to wear sunglasses that indicate they block 100 percent of UV light, whenever you’re outside. If the label states “UV absorption up to 400 nm, that’s the equivalent to near 100 percent UV blockage. Ophthalmologists often see patients with work-related eye trauma that could have been prevented with proper eye protection. In the U.S., more than 20,000 eye injuries occur in the workplace every year. Most of these injuries don’t result in serious consequences, but some patients are left with permanent vision loss or blindness. When working in an environment that necessitates eye protection, goggles or safety glasses should be worn all the time, without exception. A piece of glass or shard of metal can sneak into the tiniest opening in a pair of protective eyewear and lodge in a patient’s eye. Be sure that the protective eyewear you choose, completely covers your eyes and doesn’t leave any openings on the sides. Safety glasses should also be made of a strong plastic, such as polycarbonate. 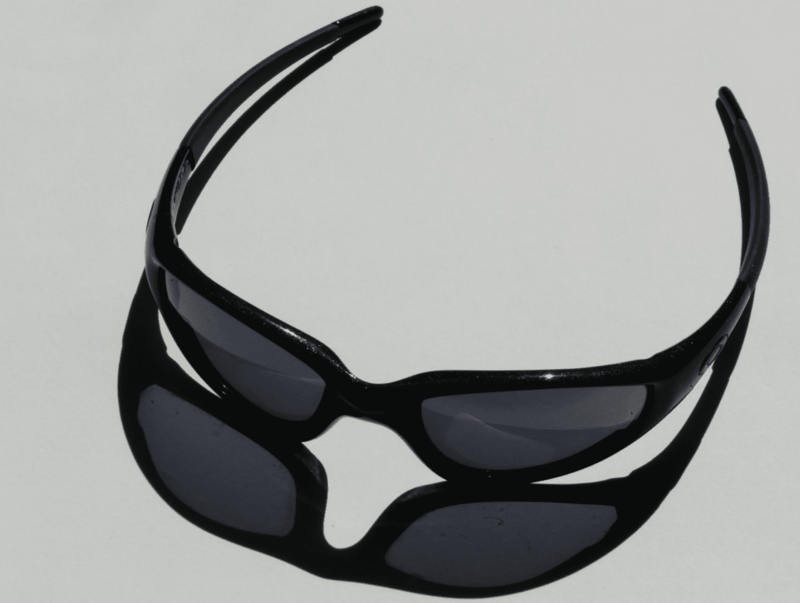 A flimsy pair of sunglasses won’t protect your eyes from a high-impact shock, such as from a piece of flying metal, and may even cause more damage to your eyes due to broken pieces of the sunglasses themselves. Protective eyewear should also be worn when operating a lawn mower, other garden or power tools and when playing sports. Glasses have become a fashion accessory, just like a pair of shoes or a scarf. As they are often the first thing other people notice on your face, why not consider investing in a colourful or fun pair of glasses that will make you feel great while wearing them?